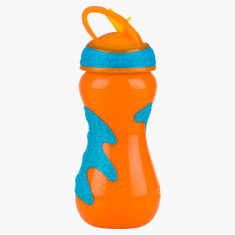 Nuby Flip Top Sipper with Grip - 450 ml | Orange | Perfect for little one with styling and cool design and easy grip. Promising a trendy statement, this sipper will make sure your kid enjoys sipping from it. Sporting a textured grip, the sipper has a flip top design to secure the straw and keep dust away. Feature 2 : Flip top helps to keep straw dust free. Feature 1 : Perfect for little one with styling and cool design and easy grip. Feature 3 : BPA Free.